It is not fully approved or completely finalized, but a document has circulated that shows Metro’s staff recommendations for open streets events for FY2015-16. Open streets events, or ciclovías, are car-free festivals primarily for bicycling and walking, more or less the same as Los Angeles’ popular CicLAvia. So far in L.A. County, cities, primarily the city of Los Angeles, have partnered with the CicLAvia nonprofit organization to host these events. The new Metro list shows the popular event spreading out to new cities and new neighborhoods, and new cities working with new organizational partners. Metro has become a major sponsor for open streets events, allocating $2 million in event funding for each of the next two fiscal years, July 1st through June 30th. The agency is allocating the funding to cities that apply. Metro received about two dozen applications, ranked them, and recommended funding twelve upcoming events. Nearly all the planned events connect with Metro’s rail system. Two open streets events are projected to coincide with the grand openings for Metro’s Gold and Expo rail line extensions under construction. Metro’s guidelines, as stated in the document, prioritize “funding one event per city before funding multiple events.” Proportionally, this puts larger cities–Los Angeles and Long Beach–at somewhat of a competitive disadvantage. The city of Long Beach applied to host three “Beach Streets” events, but only received funding for one, to take place in northwest Long Beach. The city of Los Angeles applied for funding for both San Fernando Valley and South L.A. events, but only received funding for SFV. The city of Los Angeles also found a way to squeeze in a third CicLAvia event. L.A.’s “Heart of Los Angeles” route centered on downtown L.A. is being extended east into unincorporated East L.A., so it is hosted by the County of Los Angeles, despite the event being mostly within L.A. city limits. In future calls, perhaps there could be prioritization of limited funding using some sort of per capita criteria. The upcoming open streets events list was made public on the Metro website and circulated by @Calwatch via Twitter. The “open streets recommendations” document is posted here. Update: Per Metro, the document was not officially made public yet, and the full report, which may differ from what was posted, will be released in early June. While the document includes a map (above) it is not easy to tell exactly what streets are included in each event. The document represents the Metro staff recommendations. The funding list will still need to be approved by the Metro Planning and Programming Committee, then the full Metro Board. These approvals are expected in June 2014. Though there are maps and dates specified, open streets events go through a lot of changes, so consider these tentative. Below is the full list of upcoming open streets events slated for approval, listed in date order. 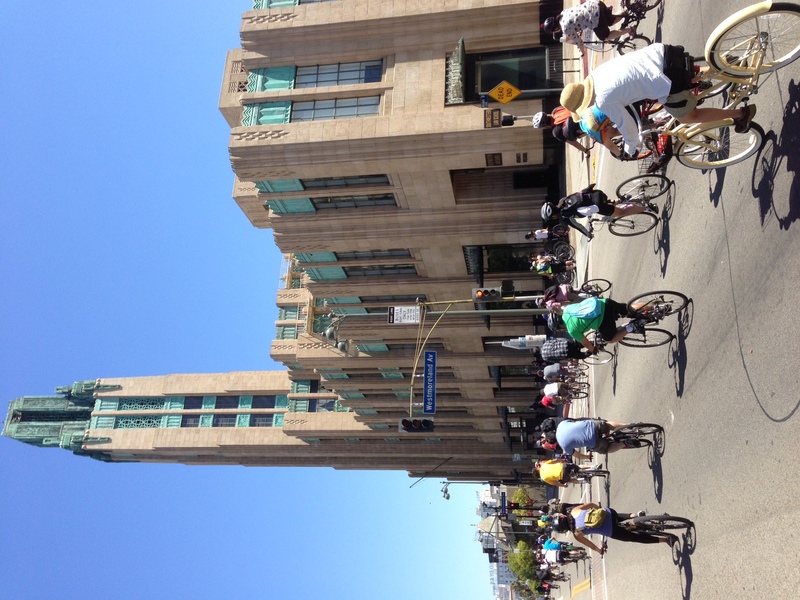 City of Los Angeles – “Heart of Los Angeles” CicLAvia route centered on Downtown Los Angeles, including new extension into unincorporated East Los Angeles. Event already announced for Sunday, October 5, 2014. City of Pasadena – “CicLAvia Pasadena” on a primarily east-west route, apparently on Colorado Boulevard, including connections with Metro Gold Line: Del Mar, Memorial Park, Lake, and Allen stations. City of Culver City – “CicLAvia Culver City” on a route roughly paralleling Ballona Creek from the Expo Line to the beach. City of Lawndale – “Lawndale Community Bicycle Ride” on a square-shaped loop route. City of Los Angeles – “CicLAvia the Valley” on a southern San Fernando Valley route that appears to include Lankershim and Ventura Boulevards, with connections to the Metro Red Line. CicLAvia the Valley was recently profiled in the L.A. Register. 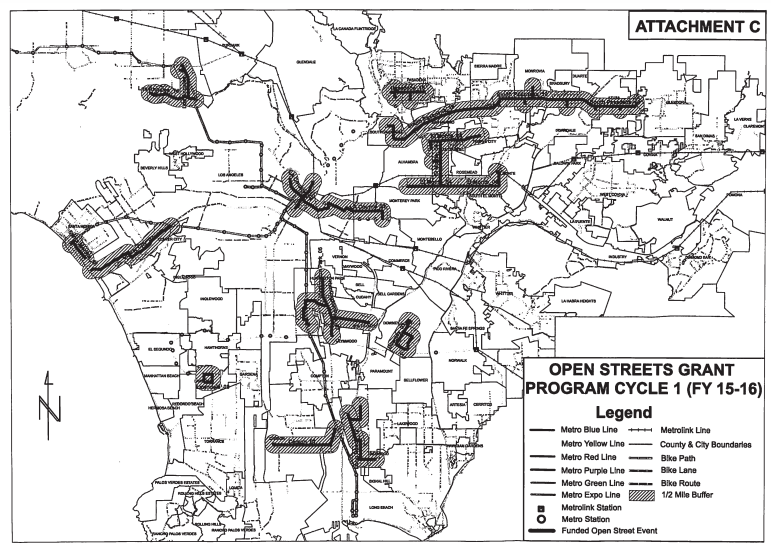 City of Downey – “Downey Ride and Stride” on a loop route, located 0.4 miles from the Metro Green Line. Cities of South Pasadena, San Marino, Pasadena, Arcadia, Monrovia, Duarte, Irwindale, and Azusa – “San Gabriel Valley Golden Streets” on long east-west route, to tentatively coincide with the grand opening of the Metro Gold Line Foothill Extension. Golden Streets was recently profiled in the San Gabriel Valley Tribune. City of Santa Monica – “Expo Opens Santa Monica” event to coincide with the grand opening of the Metro Expo Line Phase 2. The route appears to include Colorado Avenue and Main Street. I presume that there’d still be CicLAvia events in the City of Los Angeles in 2015 and 2016 that aren’t shown here? This post would indicate that the only City of LA CicLAvia events forthcoming are two in 2014, the SF Valley in early 2015, and that’s it. Seems like that’d be awfully short-sighted. Yah, this is a new funding stream, so these should be in addition to the 3 per year that is currently the norm. To clarify the document was posted on a publicly accessible Metro web site where draft board reports are posted. No Metro staff participated in the “leak” nor was I subject to any embargoes or confidentiality requests. The pages I uploaded are just a few pages from a much longer report, which you can find yourself should you be inclined. As Board reports are revised up to the date of the meeting and in committee anything could change, but this is the draft as presented by the Metro CEO’s office. South LA gets the shaft (again). The street that has the history, and which should rightfully be the host of the Valley CicLAvia event, is Van Nuys Blvd. Three words: Cruisin’ the Boulevard. During CicLAvia Wilshire, the Petersen Automotive Museum put some of its collection on display in one of the pedestrian areas. Imagine if local custom car enthusiasts were showing off their rides in pedestrian areas along the route? Wouldn’t that be cool? Van Nuys Blvd. has great places to have hubs, like the Civic Center, Plaza del Valle in Panorama City, and Van Nuys Sherman Oaks Park. I guarantee that it would be a wildly successful event. Both SLA and Inglewood. Disappointing. At least Pasadena has experience with closing off Colorado Blvd every January 1 or 2.